NOTICE: Check if an old gasket remains on the pipe. If remains, remove it. Check if any bolts or nuts are rusted. (a) Remove the 2 bolts and pipe tail from the exhaust pipe center. (b) Remove the pipe tail from the exhaust pipe support. (a) Disconnect the heated oxygen sensor (bank 1 sensor 2) connector. (a) Remove the 2 bolts and pipe center from the exhaust pipe front. (b) Remove the pipe center from the 4 exhaust pipe supports. (a) Remove the 2 bolts and pipe front from the exhaust manifold. (a) Install a new gasket and the pipe front to the exhaust manifold with the 2 bolts. 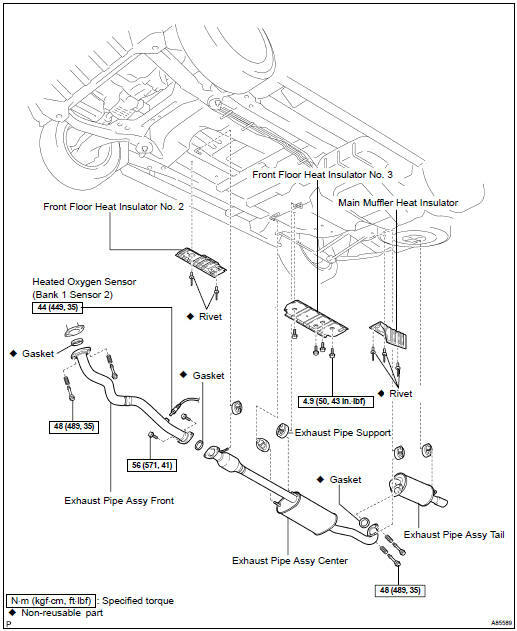 (a) Install the pipe center to the 4 exhaust pipe supports. (b) Install a new gasket and the pipe center to the pipe front with the 2 bolts. (a) Install the heated oxygen sensor (bank 1 sensor 2) to the pipe front. Before installing the sensor, twist the sensor wire counterclockwise 3 and 1/2 turns. the sensor and reinstall it. (a) Install the pipe tail to the exhaust pipe support. (b) Install a new gasket and the pipe tail to the pipe center with the 2 bolts. Torque: 48 NVm (489 kgfVcm, 35 ftVlbf) (c) Install the pipe to the 3 exhaust pipe supports.